In the past few years I’ve read a lot of different relationship books, and most of them are psychology books. They tend to be factual and talk about the way people work, the way relationships work, positive and negative actions etc. They usually have quite a bit of valuable content, but honestly? Most of them are pretty damned boring to read. Every relationship is different, so I don’t believe there is a “one size fits all” solution to relationship issues. So when reading something my approach has always been to see if anything resonates with me. If so, I try and adopt it. If not, I ignore it. A lot of the content in relationship books is just common sense – things that seem obvious. “be kind to your spouse”, “don’t sleep with other people” kind of stuff. But although obvious, they do talk about many traps that are easy to fall into if you aren’t careful. So sometimes getting a reminder of that “common sense” is beneficial. 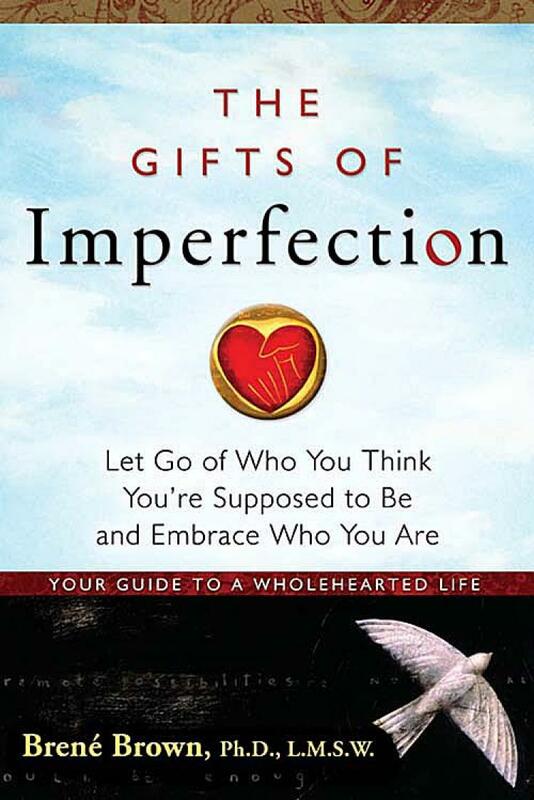 Recently someone recommended I read “The Gifts of Imperfection” by Brené Brown. I knew a little bit about what it was about, but I was still expecting more of the same old dry psychology texts with case studies. I ordered it online, and when it showed up I was a bit alarmed to see a “featured by Oprah” sticker on the cover. Now, I don’t think I’ve ever even seen a full episode of Oprah. The only time I ever see daytime television is at the dentist’s office and the daytime television of choice there seems to be Springer or Dr. Phil (which is surprisingly entertaining). Anyhow, although I’ve never watched Oprah I have this image of her stuff as being all new age touchy-feely. Sure I spend a lot of time thinking and writing about relationships, and I’m relatively in tune with my emotions. But I’m still a guy. When I see a nail, I look for a hammer. I’m not sure if new age is really my thing. Wholehearted living is about engaging in our lives from a place of worthiness. It means cultivating the courage, compassion, and connection to wake up in the morning and think, No matter what gets done and how much is left undone, I am enough. It’s going to bed at night thinking, Yes, I am imperfect and vulnerable and sometimes afraid but that doesn’t change the truth that I am worthy of love and belonging. Wholehearted living is not a onetime choice. It is a process. In fact I believe it’s the journey of a lifetime. I mentioned earlier that when I read something, I see if anything resonates with me. And I’ve gotta say, that opener hit home. I didn’t just read it, I felt it. If you’ve read any of my prior posts you will know that I believe life is all about choice. Your outlook on life is up to you. Happiness is a choice that you make. Even love is a choice. Situations and problems don’t resolve themselves – we choose what actions we take (and doing nothing at all is also a choice). So that opening really spoke to me. This wasn’t like most of the books I had read. And honestly, it wasn’t even a relationship book. It wasn’t all about facts, instead it was full of big ideas. …well, you get the idea. If maybe our situation was different, or we were something other than what we are right now. Part of it may be fear – oh I can’t do this because… But another part of it is that people often don’t feel they are “enough” and they think they need to be something more. The message was that you need to accept yourself as you are and believe in yourself. You need to accept that although the person you are isn’t perfect, you are enough. Embrace yourself and accept yourself for who you are. That’s not to say we shouldn’t all strive for self improvement. But we should be accepted for who we are and not feel we need to fit some mold. Perfectionism is not about achievement and growth. Perfectionism is the belief that if we live perfectly, look perfectly and act perfectly, we can avoid the pain of blame, judgment and shame. This had never occurred to me, but I think it makes sense. A healthy approach to problems is that they are opportunities for improvement. But I’ve seen cases where people get really upset when one little thing goes wrong. Something may be going 98% right, and instead of appreciating how well things have gone I have seen people who place what appears to be an irrational focus on the 2% that went wrong. In our search for worthiness, people have things they turn to when times are tough. Escapes that allow them to take the edge off any pain they may be feeling. The book talks about numbing behaviors, and defines them as any actions people take to avoid experiencing the pain of feeling unworthy. Addictions are the most common things people would think of as numbing behaviors, and they can be drugs, alcohol, gambling etc. But really, anything can be a numbing behavior. Books, TV, the internet, Facebook, video games, even exercise. We cannot selectively numb emotions. When we numb the painful emotions, we also number the positive emotions. So when we turn to something to try and escape the lows points in life, at the same time we are dulling the enjoyment we can have, and limiting the high points in life. I think that self love and accepting who you are is very important. And the importance of it can be seen when you look at how it impacts us in relationships. I believe that to feel loved we need to believe we are accepted for who we are. But if you go back to the gemstone idea from my last entry, it’s not easy to say who we really are. We are a lot of different things. In that entry I mentioned that the people who are closest to us are able to see the most of us, and our spouse should be the person who is closest to seeing the whole person. Everyone holds back to some degree though. We all have parts of ourselves that we are embarrassed of or ashamed about, and we try to hold those back even from those closest to us. Here’s the problem – if we don’t love ourselves we are liable to hold more of ourselves back from the relationship. This is kind of like the numbing behaviors from the book. If we try to numb the pain, we also numb the positive emotions. As we hold back from our relationship for whatever reason (maybe we are scared to not be accepted or we are scared to fail), then we are also limiting the happiness that we can potentially have in that relationship. What we get out of our relationships is directly proportional to what we put in. So for the greatest level of fulfillment we need to commit ourselves fully, body and mind to the relationship. But in order to fully vest ourselves in the relationship, we first need to be able to look in the mirror and be happy with what we see. And that’s not always easy. So today’s advice to anyone out there is quite simply, love yourself. Love yourself and accepting yourself for who you are, and work on loving yourself every single day. Accepting yourself for who you are isn’t the same as resignation that you can never change. It doesn’t mean you can’t improve the things that you aren’t happy about. But it does mean that you don’t believe you need to change those things in order to be happy. I didn’t just read it, I felt it. Thanks for reading Patti, I’m glad you enjoyed the post. For such a small book, it really packed a lot of ideas. I’ve long been a believer in continuous self improvement, and Brene Brown’s book gave me a lot of things to think about and see how they apply to my own life. Yes I agree – small book that packs a punch. Very applicable to my life for sure! Thank you for the kind words Yael. I’m new to the blog-sphere, but I’ve always enjoyed writing and I’m passionate about the topics I’ve been writing on. Hopefully some of that shows through. You have some great insight, however it doesn’t mean you get out of a relationship what you put in. Even if you commit yourself – body, mind and soul, it STILL does not mean your partner will reciprocate the same level of commitment. In some cases it gives your partner a sense of security that they can sometimes take for granted. Just to clarify, I don’t believe you get out what you put in. Rather, I believe that what you can get out of a relationship is limited by what you put in. Think of it more like a max. We are all looking for belonging, we all want to be valued for who we are. But that can never happen unless we allow all the walls and barriers to come down and we open ourselves fully to the other person. If you hold yourself back, and not fully commit yourself to the relationship you are putting limits on what you can potentially get out of it. If you put 50% of yourself in, you max out at 50% of the happiness you could potentially have vs. if you put 100% of yourself in. You are right in that it doesn’t mean your partner will reciprocate in the same way. Ideally both people commit themselves fully, and that allows for the maximum potential connection between two people.